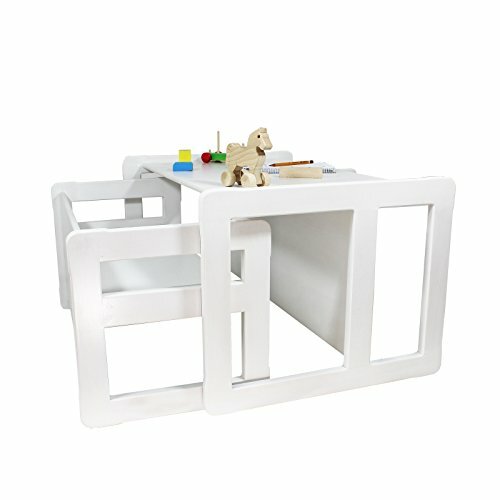 3 in 1 Childrens Multifunctional Furniture Set of 2, One Small Bench or Table and One Large Bench or Table Beech Wood, White Stained by Obique Ltd at Indsight. MPN: OB_SET_O_00105. Hurry! Limited time offer. Offer valid only while supplies last. Usage options of this 3 in 1 Childrens Multifunctional Furniture Set of 2, One Small Bench or Table and One Large Bench or Table Beech Wood are: 1. 1. Large Children's Bench with High Seat (Seat Height 32 cm) or Large Children's Bench with Low Seat (Seat Height 20 cm). 2. Small Children's Bench with High Seat (Seat Height 21 cm) or Small Children's Bench with Low Seat (Seat Height 14 cm). 3. Large Children's Table (Table Top Height 38 cm). 4. Small Children's Table (Table Top Height 32 cm). 5. Adult Nest of Two Coffee Tables (Tale Top Heights 38 cm and 32 cm). These items can be used in a set with our other multifunctional Adult Coffee Tables and Children's Chairs, Tables and Benches to provide over 40 different combinations of Multifunctional Nests of Coffee Table Sets for Adults and Multifunctional Table, Chair and Bench Sets for Children. This listing is for 3 in 1 Childrens Multifunctional Furniture Set of 2, One Small Bench or Table and One Large Bench or Table Beech Wood, White Stained. These items are part of our Multifunctional Children's Furniture System and unique Multifunctional Adult Coffee Tables that includes Multifunctional Tables, Chairs and Benches designed to our specifications that enables multiple uses of the same items as described below simply by turning the furniture item through 90 degrees. These products are light weight and sturdy to allow the furniture to be easily and safely handled by children, and have no sharp edges or pinch points that could harm a small child's fingers. These items are suitable for children aged 18 months to 7 years and are ideal for families with children and also for grandparents who have occasional visits from grandchildren. These items can be combined with our other multifunctional Children's Chairs, Tables and Benches and Adult Coffee Tables to provide over 40 different combinations of Multifunctional Nests of Coffee Table Sets for Adults and Multifunctional Table, Chair and Bench Sets for Children. If you have any questions about this product by Obique Ltd, contact us by completing and submitting the form below. If you are looking for a specif part number, please include it with your message.